dressed up like a lady: Relic of the past. Hunting through my computer for some shots of a friend's wedding, I found this picture, taken a few years ago. Funny, that a pic so representative of myself at the moment now seems so ancient! 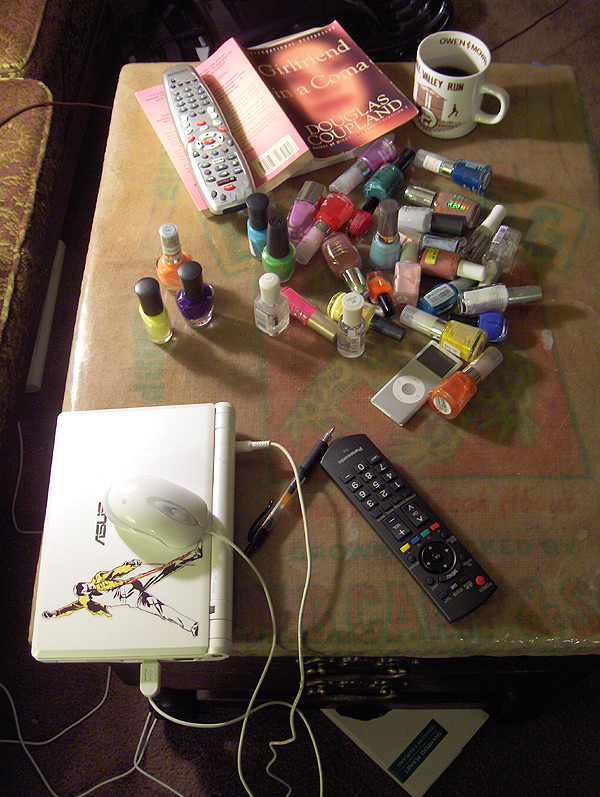 Nail Polishes: This is from when I had time to paint my nails! I'm actually home sick today (boo!) and if I'm respecting my doctor's orders, I should be resting. Maybe I should paint my nails, while my hands are still. Dang, that's a lot of nail polish. When I feel bad, I like to see many colors, that just makes me better, this picture is cute, too many colors, but make it perfect. A million nail polishes! The happiest state for any coffee table to be in. I know what you mean about a photo being a still life of you, seeming so far away yet so completely relevant. I am addicted to nail polish. Seriously. All I have to say is that it's a darn good thing I'm so stinking cheap and buy the crap-o $2 colors at Wal-Mart. I'm likin' the deep purple you have-- I need to add that one to my collection!